I wasn't sure if I would enjoy this book as I'm not really a fan of short stories, nor short movies either. I like time to become absorbed in the plot and the characters. Short stories, by their very nature, always feel a bit rushed. Likewise I wasn't sure if I liked the style of writing for the first half of the book...and yes it does feel like sacrilege to be criticising Hemingway!! I found the constant repetition of words, phrases and thoughts a little annoying for a while until I got used to the fact that the story was being "told" by an old man whose mind tended to wander, and switching between his inner voice and answering himself out loud. The return journey with the shark attacks was my favourite section of the story with just the skeleton of the marlin left by the time he got back to shore. Similar to Santiago being a skeleton of his former self. The flashbacks to his younger days - his 24 hour arm wrestle etc - were a good contrast to his older body failing him in his battle with the fish. Oops just realised I'm a day early...apologies!! Reading the first few pages, it seemed, like Cuba hasn't changed much since I last visited (about10yrs). The poverty of the old man was still visible but his attitude is also very much Cuban. They're great people that always have a smile on their faces with a positive outlook on life, even though, they don't have the luxuries we do. Anyway, just my initial thoughts. A fathom- equal to about 6 feet. Learned something new today . FISH ON!!! What an epic fight this is!!! The descriptions of the old mans' persistence are painting a vivid picture in my mind. If I had a fish, for every time I heard/said: “'Fish,'' he said, ''I love you and respect you very much. But I will kill you dead before this”, I'd have caught a lot more fish . Funny; reading about his aloud comments, followed by Hemingway's inner thoughts, makes me feel like someone is there on the boat with the old man. As if someone is watching the whole thing and just standing back. Epic fight so far but I'm getting to the part where things are starting to get tough for the old man. Not liking this...but he prevails!!! Finally, the lights are in sight but the fish is all but gone. Makes me sad. His struggles to reach the hut made me feel his pain. And, it's over. In his failure to bring in the fish, he achieved his greatest feat. The struggle; the perseverance; the skill, the mental fortitude. All proven by what he did. Damn! That was a good read! Good pick Richard. It was a story I always heard people talking about but never read (or knew much about). Edit: I posted before I read your review and I just realized that I'm early as well . *chuckle* usually I am the early one, but I have just finished reading the book, and read the above reviews. I have never read Hemingway before, avoiding his books because the people who talked about them seemed to be pretty pretentious and snooty. Not to mention so much analysis, breaking down the book into sentences and wondering what Hemingway meant. I to had trouble getting into the book, lots of repetition (I HATE REPETITION!) 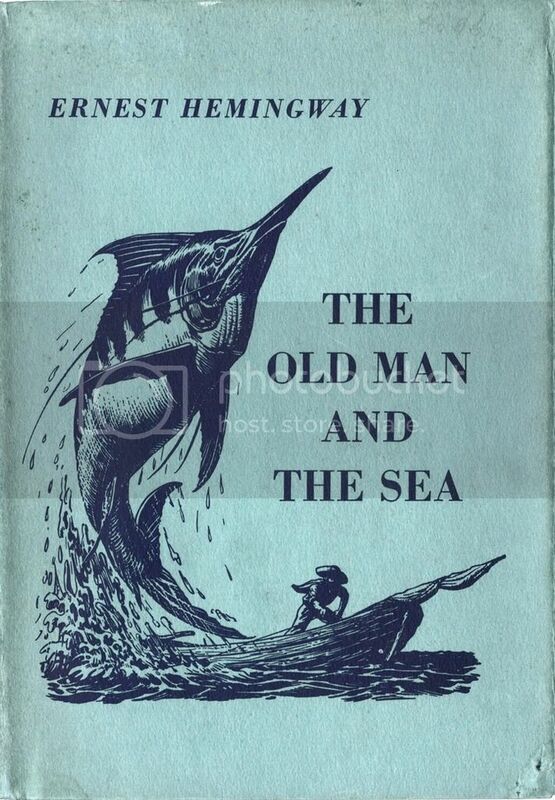 and the ramblings of an old fisherman. I started getting into it though when he was chatting with himself about loving the fish and how sorry he was to have caught it, but was glad he caught it so he could sell it. I really felt for the gentleman being so far out at sea in what I read to seem as a smallish boat and no supplies. His determination was amazing, I don't know if I could have done that. He has the attitude of some North American Indians, not killing something unless needed and to say thanks to the fish for giving it's life. I was getting board when he first caught the fish and it took over a day for him to get it tied to his boat. My interest really picked up with the Sharks though and part of me wanted to be there to help him fend off the sharks so he could have his catch. I would have like to have read more about the boy - he seemed so respectful of the old man and a good friend by looking after him like he did. I have done some fishing in the past, and I also followed the rule of no speaking, or moving around much. I am not a great fan of fishing though - had the life scared out of me as someone caught me on the back with a hook and it almost went into my skin. I read this book in 7th grade and I absolutely hated reading but.... BUT loved it as a kid and now reading it again as an adult many years later I had a feeling of nostalgia! I remember my emotions I had as a kid feeling sorry for the Marlin and how he gave praise and honor to the Marlin and referred to the Marlin as a brother... those feeling as a kid came rushing back to me and it was PRICELESS... when I read those parts of being drug out to Sea to battle the Marlin for over 2 days and building a relationship of Respect and Honor with the Marlin, having his 1 on 1 time to reflect on what it would be like if he was the Marlin realizing both their struggles to live and fighting hard to stay alive... and in the end despite the misfortune of the Sharks the Old Man gets his well deserve recognition of a true great fisherman!!! I now truly believe it is bc of this book I gained a huge respect for all living "beings"
I always felt there was a personal message to his audience with this book... as a kid I did not really appreciate the emotions on a broad spectrum well bc I was just a kid... but going back and reading it again after my life experiences so far as an adult I can respect the great powerful message that I received and the life lessons I truly learned and realized from this Great book, The Old Man & The Sea! I also had the nagging feeling during the last quarter of the book that the old man wasn't going to make it back to shore. It really could have gone either way and I wonder if Hemingway even considered an alternate ending. I, too, hate repetition, but, in this book, it never bothered me. It paralleled the Old Man's life and, for me, enhanced the story. As for symbolism, Hemingway, through the Old Man, says what he means straight out. There is no need to dig for deeper meanings. It is all raw and true. "You are killing me, fish, the old man thought. But you have a right to. Never have I seen a greater, or more beautiful, or a calmer or more noble thing than you, brother. Come on and kill me. I do not care who kills who." How had I dismissed this as a mere story - boring, at that - when first read? Even as a 12-year-old, how had I missed what was plainly said? The Old Man was equally beautiful and noble. There is so much depth and brilliance to the characters, the man and the marlin, to the point that I felt I now know both intimately. What came as an even greater shock is that I knew someone very much like this through stories my mother told me of my grandfather - a farmer, guitar maker and sometime coffin builder. It made sense to why one of my mother's favorite phrases was, "we do what we must," now taking on multiple, complex - and personal - meanings. It made me realize how far removed I've become from my heritage and now wish I had asked more questions before those who could answer were gone. "'Ay,' he said aloud. There is no translation for this word and perhaps it is just a noise such as a man might make, involuntarily, feeling the nail go through his hands and into the wood"
as though he were being crucified for his sins and the sharks are his penance. "No one should be alone in their old age, he thought. But it is unavoidable." "The sail...looked like the flag of permanent defeat." His scars were "as old as erosions in a fishless desert." "'Thank you,' the old man said. He was too simple to wonder when he had attained humility. But he knew he had attained it and he knew it was not disgraceful and it carried no loss of true pride." I love the collection of quotes Selkii. I must try the highlighter on the next book if it warrants it. Unexpectedly, I keep going back over the story in my mind, 48 hours after finishing the read. So it must have had an effect. I'm also glad that I can now say I have read some Hemingway. Does anyone have a favourote of his that I should read next? I started reading OMATS using iBook, but switched to The Kindle app as I like its features better, especially its highlighter/copy. I always thought I didn't like Hemingway - too chauvinistic. Reading this one book doesn't mean that still isn't true in general, so I don't have any suggestions...yet. PS whenever I read or watch a movie I initially don't like, then have it keep popping up in my brain, that means I have to read/watch it again because I must have been impressed with something. If I truly don't like a book/movie, it is erased...no waste of brain cells. It was an interesting short story. I am not sure I liked it. I know I didn't hate it. I can see why the story resonates more with some of you. Perhaps I'm just a little worn out lately and cannot enjoy the pyrrhic victory. Sure the Old Man brings back the fish, but the cost is, well, as he said, the fish was killing him and he didn't care how. So, now that we've all had our chance to chime in, I'm starting to realize that there are a tonne of classics I've never read. Mainly, because I grew up in Greece, and these books weren't available to me, in a town of 2000. But ask me about Greek mythology and some of the Classical Greek stories (Iliad and Odyssey) and I'm your man. Alas, I started thinking about some of the books people would tell me they've read and I keep coming back to one: Frankenstein! I don't really know the story or the ending so I figured I'd throw it out there as a suggestion. It's listed as 260 pages, which should accommodate most of our real lives without burdening us. Opinions and any other suggestions? I would read Frankenstein - again - at the drop of a hat. Another horror classic everyone should read is Dracula. This "revival of classics" bug bit Don. I was shocked to find he was reading the Sherlock Holmes series which he has never read before beginning with Hound of the Baskervilles. He is more of a Tom Clancy or political non-fiction sort of guy. Yup I'm definitely up for Frankenstein, or the Modern Prometheus next, especially as it's one of the many classics free in the Kindle Store.